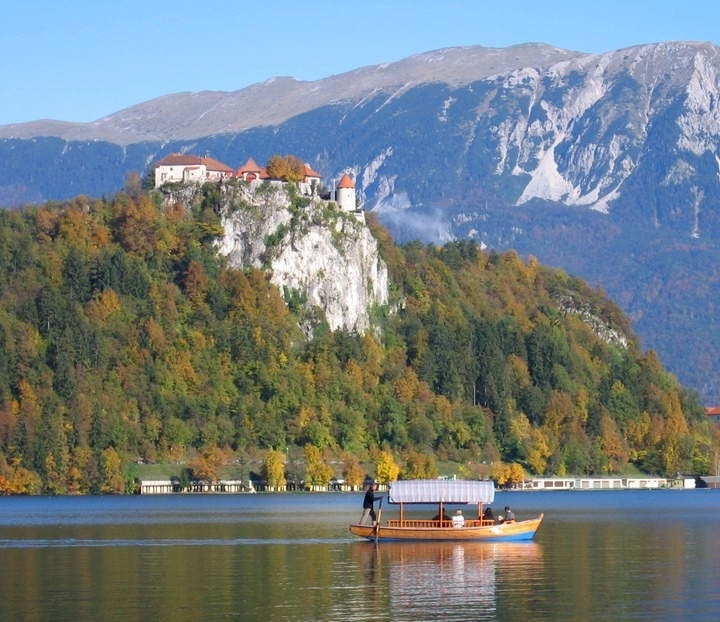 Into Slovenia and the gorgeous setting of Lake Bled. The church on the island. We rowed all round it. Well, only one of us did the rowing. Someone has to take the pictures, right? I smiled thinly. The man next to me wasn’t Woody Allen; he just thought he was. 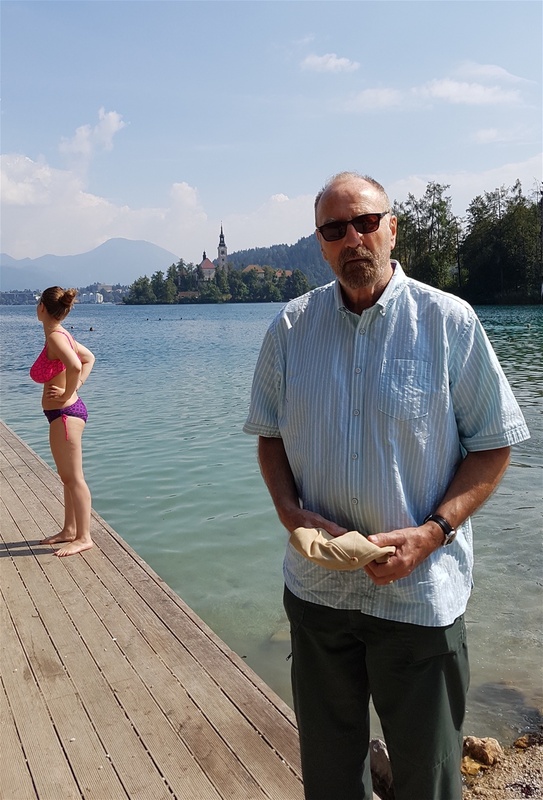 We were ‘somewhere in Slovenia.’ Far enough off the beaten track to be lost, technically, but not far enough to be concerned about it. 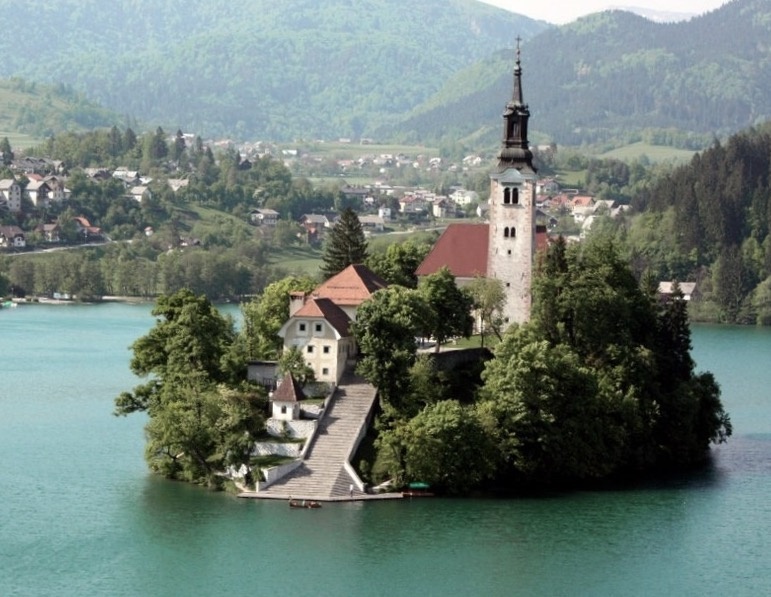 On our way to Lake Bled, but not in any rush. Getting lost is half the fun and. I had a pretty good idea which way to gol. The weather was warm, the countryside was peaceful and all was well. I unfolded our B and Q special offer canvas chairs and we settled down to read for a while in some welcome shade. Perfect! Right up to the moment another car turned up and parked next to us. Right next to us. There was room enough to park a thousand vehicles, but this one chose to stop alongside. Even worse: they were Brits. We hadn’t seen a soul all day; hadn’t seen a GB plaque for the past three days and yet here was a massive four wheel drive Chelsea Tractor blinged-up Range Rover putting us in the shade, in every respect. They were a couple in their mid-30s, dressed in the clothes most people reserve for doing dirty jobs in the garden and eager to chat. We’re British, we’re polite, so we get up from our chairs, abandon our books and say hello. When I say we’re polite, what I mean is one of us is naturally polite at all times and one has to be occasionally reminded of his social responsibilities. Granted, I don’t suffer fools, gladly or otherwise, but with a three-line-whip in effect I plastered the rictus of a smile on my face and ‘chatted’ to Mr and Mrs Dickhead. I looked at ‘the little woman’, - as tall as me and twice as broad – and managed to keep my face straight. We shook our heads in unison and Marigold turned her head to face the opposite direction from the way we intended to travel. ‘Maybe…’ she muttered vaguely, but they failed to take the hint. Lowering the rear shelf and perching on it, they settled in for the day, or so it looked. How we laughed at the tales of their exploits. Hmm! 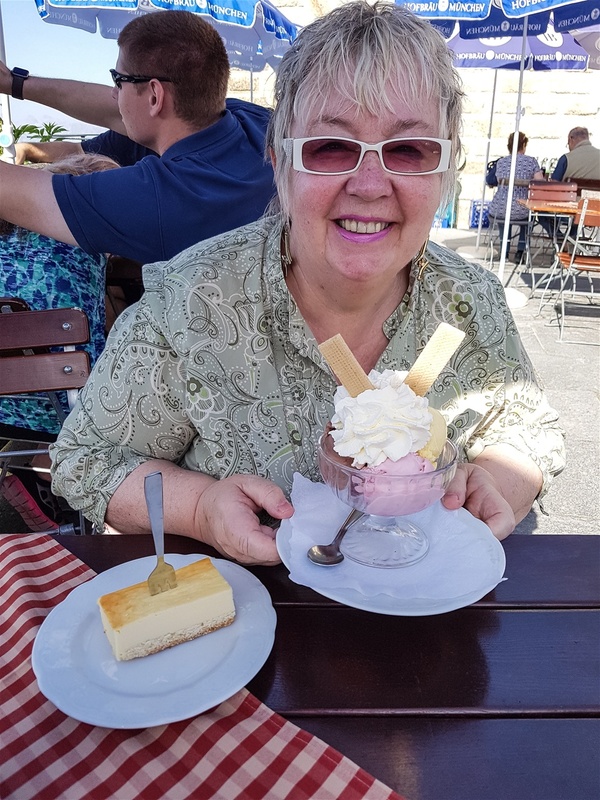 Denis and Diane – ‘the dreaded Ds, ha ha ‘– didn’t think much of Slovenia.They’d arrived here by way of Germany and Austria and didn’t think much to Germany or Austria either. ‘Too, er, foreign?’ I wondered. My wife gave me a nudge to remind me to behave, but I was looking longingly at my abandoned book and wondering whether throwing our chairs in the boot and just driving off would be construed as being ungracious. ‘We were thinking of Italy,’ I volunteered. ‘Only a few miles back up the motorway, there’s a turning on the right. Italy is so…’ I paused for a moment as if in search if the mot juste, ‘civilised,’ I concluded. We made suitably enthusiastic replies and said we’d be right behind them. I loaded up the car and dutifully followed the Range Rover back to the motorway junction. They turned right, we turned left and were soon back on the road to Lake Bled. Fantastic place, this. Quite ridiculously scenic. We had lunch, booked into our hotel – bedroom looks straight at the lake – and then went off or a row. That’s a row as in rowing boat, not row as in domestic dispute. Over to Marigold now for some nonsense, aka the best bits. Left previous hotel and manager gave us a little box of sweets with Salzburg pictures on. We had to put them in a bin as they were all toffees and am already suffering in the tooth department after encounter with the black bread. Great excitement last night a farmer had a goat killed, he said by a wolf. How dangerous, as we had slept with the window open and had been eating meat on crackers. 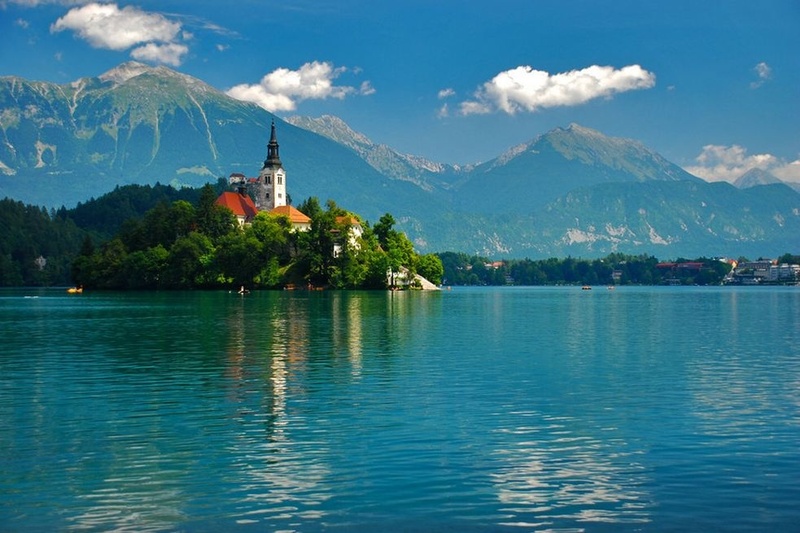 Journey to Slovenia breathtaking. Lots of castles. Loved it. We had lunch, none of the food we understood. We ended up with chickflaustrudle or something. It was really disgusting. For pudding we both had 3 Rennies and a spoonful of gaviscon. The hotel by the lake is really old fashioned with lots of crocheted cushions. In our room is a picture of a very young Cliff Richard. Thankfully it wasn't Rolf Harris or we would have asked to be moved. G rowed us around the lake. It was quite choppy in places but very romantic, except it made him rather sweaty and also a bit sweary. We are off to look at waterfalls. The man at the hotel described them as water, falling from high up. Sound very exciting. He also said breakfast is all you can eat. We will certainly give that a miss. Lots if people swimming in the lake and lots of swans too. Must be the Slovenian version of swimming with dolphins. The swans are more attractive. What a place this must be to grow up in. We come back to the lake several hours later and it is still a hive of activity. Loads of kids paddling on boards and swimming, even long after the sun has gone down. They start young too. Three little girls, the eldest no more than seven and the youngest a little tot of about five, have been splashing around, jumping on and off a board way out on the lake. Not a frantic parent in sight. There's a medieval castle too. The lake that has everything. G chose the ice cream, good job I am his official taster.